Conures are extremely active and have a high metabolic rate; conures also have a relatively short attention span and become bored quickly. These characteristics directly relate to the types of food they consume as well as the variety they need. 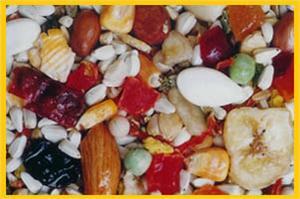 Parrots & Company Premium Conure Blend contains more than 30% fruit, nuts and vegetables mixed together with a broad range of fresh grains all of which offer different shapes, colors and textures. Supplying the necessary nutrients in an abundance of natural foodstuffs provides optimum nutrition and the pleasure of enjoying food. Parrots & Company Premium Conure Blend diet is formulated to meet the nutritional requirements of conures, quaker parakeets, ringneck parakeets, senegal parrots and similar hookbills with a relatively high metabolism.